We've started to do some updates to OpenNTF.org. While we want to improve the functionality of the site, another goal of this effort is to simplify as much as possible so that a later UI/design update will be much easier. Below is a first set of changes we've implemented. 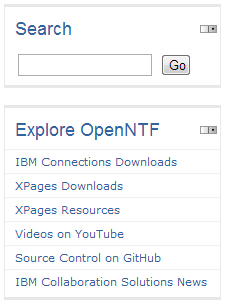 The 'Explore OpenNTF' section has been updated. For example we removed links to unused pages and added new links to GitHub, YouTube, etc. We also changed full text search. Rather than having our own search functionality we now simply use Google which often shows better results than our old search functionality. We also removed and changed all pages which still had the old yellow style, for example the blogs archive page. All visible pages (except registration) should now use the blue style and only XPages should be visible in the UI. 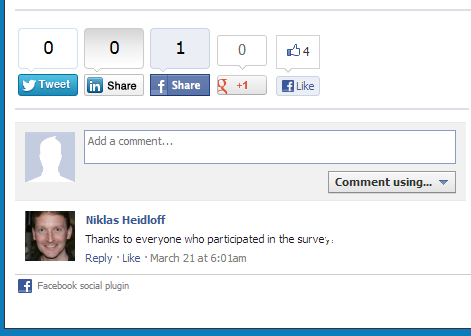 Since we received a lot of spam in our blog, we removed our own blog commenting feature and replaced it with Facebook comments. We're working on more and will blog about it soon.